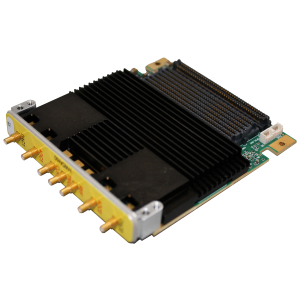 These ultra-low latency mezzanine cards are specifically designed for DRFM applications with latency as low as 20ns from SMA to SMA. Ultra-Low Latency DRFM-Optimized Mezzanine Cards have been designed from the ground up for latency-sensitive DRFM applications. The Board Support Interface, which is available in VHDL or Open Project Builder™, was designed from the beginning to be suited for DRFM applications. This interface provides a Digital Bypass Mode to achieve the lowest possible latency and a Fabric Space Mode to allow the user to do additional processing and manipulation of the ADC data before returning it out the DAC. The Fabric Space Mode adds as little as 12ns of latency. The Board Support Interface also includes a built-in Bypass Delay. This allows the user to “walk” the latency out from the minimum Digital Bypass Mode latency to slightly beyond the Fabric Space Latency, providing for a smooth latency transition between the two modes. Open Project Builder™, Annapolis’ FPGA Design Tool, allows the user to design a DRFM-optimized application in minutes. Founded in 1982, Annapolis Micro Systems (AMS) is the leader in FPGA-based super-high-performance systems utilized for data acquisition and signal processing applications for defense and commercial requirements. AMS systems are truly COTS-based due to the development of a breakthrough product line – WILDSTAR™ – and ecosystem – WILD100™ – that feature unprecedented interoperability, scalability, and forward/backward compatibility. All AMS products are engineered and manufactured under one roof in the United States. This co-location of engineering and manufacturing allows for better quality control and production flexibility, and substantially more aggressive delivery schedules. Time to market is also accelerated by AMS’s Open Project Builder™, an open application development tool that significantly simplifies and speeds programming.